My artist and My thinkin’ master…. You here a LOT about Annabelle on this blog, mostly because she has the most “news” to give, but also because my older kiddos actually “read” this blog sometimes… so I can’t highlight their antics without getting in trouble! HA! I can, however, brag on them like crazy! And today, I have a good bit to brag on! Funny part of this pic: Annabelle in the back. 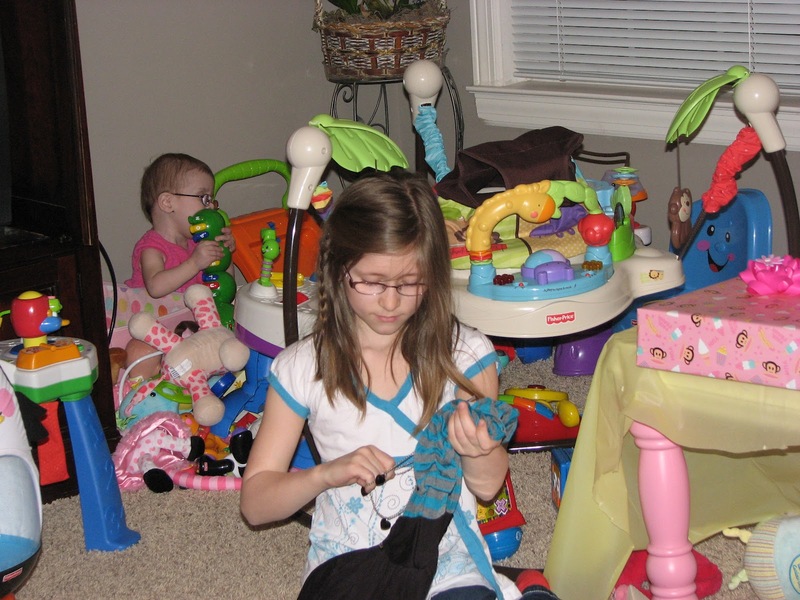 She’d climbed over ALL those toys to get to the one she wanted… Lacy liked her shirt, btw, ha! My Lacy is an artist! 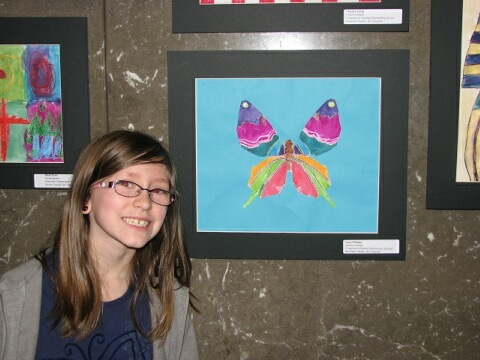 Her school has an “art” exhibit at the FRIST Center (really big art museum in Nashville) for the next few weeks. They chose 2 pieces of art out of each grade level for each school in her county. Guess whose artwork got chosen for the 2nd grade at her school????? AND!!!! The next week the county parent newsletter came out with a section talking about the art center. And guess whose art they chose to grace the newsletter beside the story?? We are SO SO SO SO SO proud of her! Saturday was the first day of exhibit, so grandmas and papa and dad and sisters and aunt and uncle all went out to see Lacy’s artwork! Mommy and Karalynn had full plans to attend to but…..
For the last few months, Karalynn has been preparing for a DI tournament, or Destination Imagination. Her group of a max of 7 kids use their imagination to do a “challenge” to present last Saturday. Now, her team that started out with 7 people dwindled down to 4 before they even started to meet… then by January, was a group of 2 girls who decided that against all odds (a late start and a super small group…) they would persevere and not give up. For that alone, I’m SUPER proud of them. Then Annabelle was in the hospital, and it got even harder because we were down to the final weeks and I as their co-team manager was not able to help (we also had all our meetings at our house…) Anyway, just put another wrench in the process. Then came the morning of the tournament. Plan: Instant challenge at 9:30, weigh-in their project (there was a weight requirement), then book it over to the Frist to see Lacy’s project, then be back by 1:00 because their challenge was at 1:50. However, when we got to the weigh-in…. the person weighing the project gave them some blowing news. Those last few weeks, they’d decided to add a little “reinforcement” to their captivator. They added river cane to each of the 3 sides of their structure they had built (the point was to get it to hold golfballs inside and weight on top.) However… it had to be built 100% out of wood… and they found out that river cane was NOT wood, but a grass instead. So, instead of going to the Frist, they spent two and a half HOURS, slowly, pain-stakingly, cutting out the rivercane from their project while trying to preserve the wood it was glued to. With about a half-hour to spare, they finished. PHEW! They did not “go to state” (top 3) but they finished strong, tried their best, and persevered when most kids would have given up. You know I couldn’t finish a post without one! Annabelle is doing FANTASTIC! Lots of follow-up appointments today, so we’ll get to find out how much (or little… I’m believing MUCH) weight she gained! She definitely LOOKS better! Her face isn’t quite so sunken in, and she has a TON of energy. I think she might have the start of another cold though 🙁 Her nose is junky! But her lungs are as clear as a bell, so YEAH for that! Wish Lacy a happy birthday in the comments! I know I know, but I’m gonna have her read them tonight so I thought it would be fun for her to read through a bunch of them! She is my SUPER DUPER special girl and deserves to feel it! Sadly, as many heart-parents can attest to, siblings sometimes get the raw end of the deal with another sibling is sick with a long-term illness. We try our best to NOT do this… but it is the nature of it to a point. My kids have weathered it SO SO SO well, I am so proud of them! Happy Happy Birthday Lacy! It's so awesome that you got to have your art shown off for the world to see! Aim for the stars!!! Happy Birthday Lacy! Your art work looks amazing! What did you use to make it? I am sure you are super excited to have your work at the Frist! Congrats and happy birthday!! (mommy dictating…) I used –um– pencil, and I used crayon, paint, and paper. That's it. Lacy, the first time I ever met you, you were a four-month-old little baby. You are growing up into an amazing, beautiful daughter of God. Your momma is so proud of you, and she has every reason to be. You're more special than you can ever know! I love your beautiful butterfly! I think you could raise some spending money by creating shirts with the design on CafePress. I'd LOVE to have one! When people say, "Where did you get your awesome shirt?" I'd say, "Oh, this is original artwork from my very favorite up-and-coming artist, Lacy Emma Leigh Phillips." Happy 8th birthday, sweet girl! 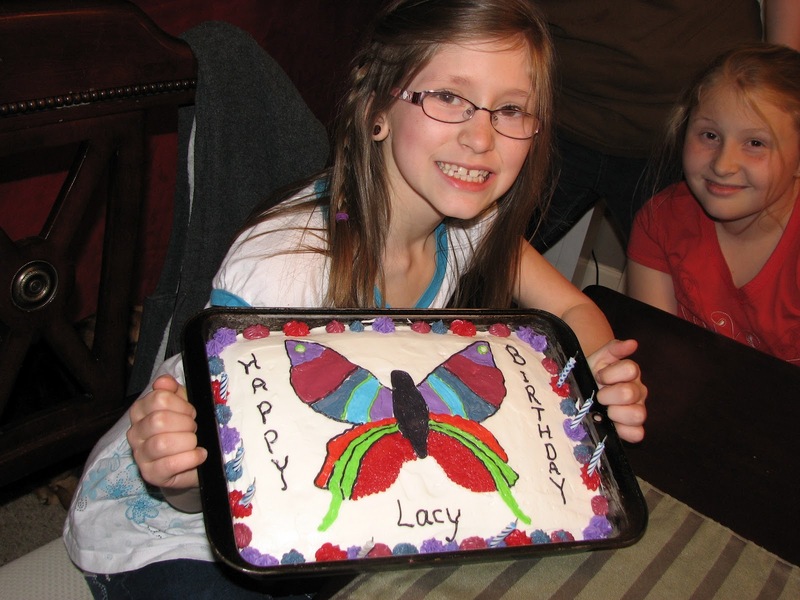 I love your butterfly, Lacy. So fun and colorful. I hope you had a great birthday today! Happy Birthday Lacy! Love that awesome art work! Happy Birthday Lacy!! you're butterfly picture is beautiful!! Happy eighth birthday Lacy!! Hope you have lots of fun today! I pray that God will richly bless you this year! Happy, happy birthday, Lacy! Your artwork is stunning, and I'm not at all surprised it was chosen for exhibit. Congrats also to Karalynn and her DI buddy for persevering and for doing so well in their competition. Woohoo!!! Happy birthday to you! Happy birthday to you! Happy birthday, dear Lacy! Happy birthday to you. Happy Birthday Lacy! I hope God blesses you with an awesome day! Loved the artwork you did a wonderful job. Happy Birthday Lacy! I hope you can feel the happy wishes coming your way all the way from Alabama…! Happy (belated) birthday to you, Lacy! I'm glad you had such a fun time celebrating. And mega congratulations on having your artwork chosen for display at the Frist and used in the parent newsletter newsletter. That makes you a local celebrity, which is way cool! Congratulations, Karalynn, for doing such a great job on your DI project. I admire you and your teammates for dealing with the challenges and building a structure that held 123 pounds. That's great! Your picture of a butterfly is amazing!!! Happy 8th Birthday! I love butterflies and your butterfly was beautiful!! You have a true talent. Have a wonderful week! Karalynn, way to go with your project, your perseverance is admirable! Good luck on your next project! And YAY for a good Annabelle update, AWESOME! Happy, happy birthday Lacy!!! Your artwork is beautiful! Happiest of birthdays to you, Lacy! What wonderful artwork and to be featured in an exhibit already- certainly an achievement to be proud of! Also, way to go, Karalynn. I hope you girls are proud of yourselves for your hard work and determination. It shows that you have strong character for remaining committed to your team. Happy Birthday. I hope you have a wonderful day. Beautiful art work. Happy birthday sweet lacy girl! Happy birthday. I go to grace church.you have an amazing family. Happy 8th Birthday Lacey, I hope you have a great day and you are a great artist. Congratulations on making the art exbit. Happy Birthday Lacy! I hope that you have a blessed day!! I hope that you continue to use the talents that God has given you to glorify him! Happy Birthday Lacy! I think your picture looks great. Happy Happy Birthday Lacy!! I pray that your day is full of many blessings and that God's love continues to shine through you! Happy Birthday Lacy!!!! I loved your art work, you did an amazing job! Dear Lacy, Happy Birthday to a beautiful 8 year old girl!! Your butterfly painting was lovely. I hope you continue to do some painting and other artwork that your mother can share on the blog! Congratulations on all your artwork accomplishments and I hope you have a terrific 8th birthday!! From Perrysburg OH (home of Sanctus Real's Matt Hammitt 🙂 which is how I 1st found out about your sister Annabelle, and started reading your mom's blog! Happy birthday Miss Lacy. I hope you had a wonderful day! Happy Birthday, Lacy! Your artwork is beautiful! Congratulations! I hope you had a wonderful birthday! Happy Birthday Lacy! Great artwork! I love it! 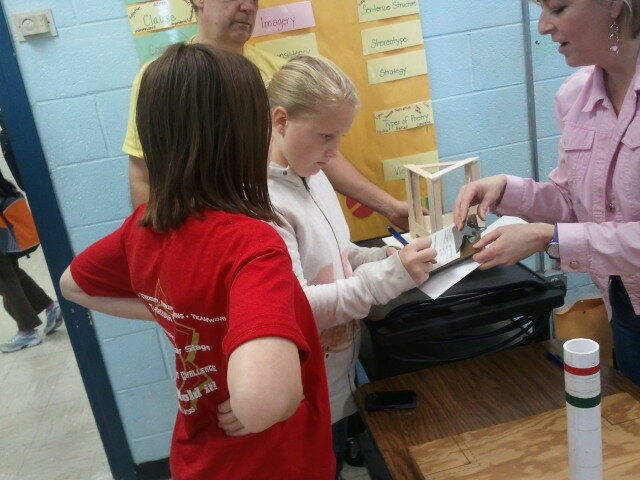 Karalynn, great job persevering with your project. Most kids (adults too!) would have given up. Keep up that attitued and you will go far in life. Happy Birthday, Lacy! I love your butterfly and the cake your grandmother made to match. Keep up the good work with your art! Happy 8th Birthday Lacy! Wishing you a year full of many blessings! How special is it that your Grandma made you a cake to match your beautiful artwork. With love and best wishes from Canada! Lacy, I am also the sibling of a heart patient. (But I'm old now.) I know sometimes it's tough because you feel like you're missing out on things other kids with "normal" siblings get to do, but hang in there! I hope you enjoyed your day and ate lots of cake. (I mean, cake is the BEST part of a birthday, right?) And congratulations on your artwork, girl! Way to go! Lacy says presents are actually the best part, HA HA ! Happy birthday, Lacy! And great job on having your artwork recognized. You are very talented! I know this is late but HAPPY BIRTHDAY LACY!!! You and my 2 year old Hannah share a birthday! And awesome artwork!! You should design the cover for your mom's next book! Karalynn, congratulations on persevering despite all odds! Next year will be better. Maybe you'll even go to state!